Entertainment Weekly just gave us an exclusive look at Christina Ricci in her role as the infamous Lizzie Borden. 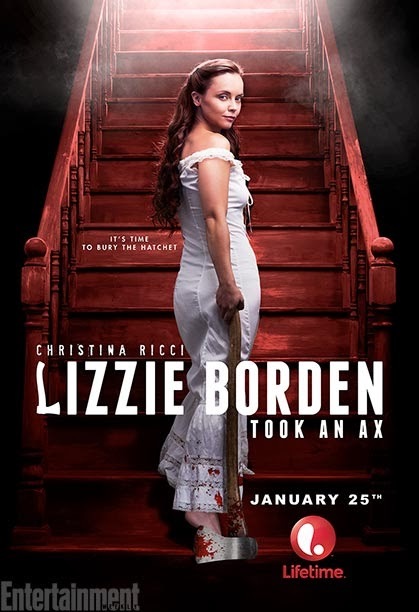 The made-for-TV movie, “Lizzie Borden Took An Ax,” will debut on Lifetime this January 25 at 8 p.m. ET. The movie is directed by Nick Gomez and produced by Sony Pictures Television. We all know the story, right? The true crime tale occurred in 1892 and elicited national attention and controversy thanks to Lizzie being acquitted of the heinous murders of her father and stepmother. The film will also star Billy Campbell as Lizzie’s lawyer, Andrew Jennings. It will focus on Lizzie’s life, the trial, her acquittal and her subsequent branding as guilty in the court of public opinion. No one was ever charged with the crime. The home where she remained and where the crimes occurred, still stands and is reported to be quite haunted. So, if you’re a fan of ghost hunting or simply visiting historic homes, head to the Lizzie Borden Bed & Breakfast Museum in Fall River, Massachusetts.